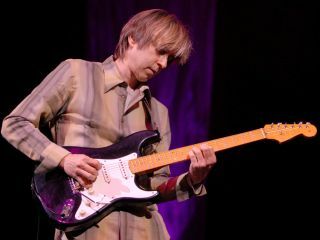 Eric Johnson lets out a sound of profound relief and says that his new album is almost finished. "We have 12 cuts done, which means we're gonna be putting this CD out soon." Those words are bound to be cause for celebration for Johnson's legion of fans across the globe who have been waiting anxiously for the follow-up to the guitarist's last studio effort, 2005's Bloom. But Johnson thinks for a second, and then, in his soft, easygoing Texas drawl, says, "Of course, I do have another song I'm trying to work out. Maybe two. Hopefully, I'll nail those by the end of the week. Then the record will really be finished." One gets the feeling that 'finished' is a subjective term for Johnson. The venerated musician, perhaps the closest thing to Stanley Kubrick the pantheon of guitarists has ever known, an artist willing to record, rerecord and ultimately scrap masters of songs in his unyielding and intensely personal pursuit of perfection, has released only five studio albums since his debut 32 years ago with 1978's Seven Worlds. "That word 'perfectionist' rattles me. I don't know one artist who I admire that isn't a perfectionist in one way or another." "I get a bit of flack about it sometimes," he admits. "But I'll tell you, that word 'perfectionist' rattles me. I don't know one artist who I admire that isn't a perfectionist in one way or another." For the still-untitled album ("I'm thinking of calling it Up Close, but I don't know if I'm sold on that yet") Johnson says he wrote 25 songs, then recorded "about 17 or 18. From there I whittled the list to roughly a dozen. I'd say 60 percent of them are vocal tunes. I tried to pick the best ones, but at the same time I have to make sure that I'm making a musical statement, that the songs all flow together. It's a process that can take a while." Working at a stand-alone recording studio he's been building in his hometown of Austin, Texas for the past few years, Johnson cut tracks with his longtime engineer and co-producer Richard Mullen, along with engineer Kelly Donnelly. Guests such as Steve Miller, Jimmie Vaughan and Jonny Lang make appearances, and in Johnson's view "any time you have guys of that caliber on your record, you're halfway home." Veteran producer and engineer Andy Johns is mixing. Johnson calls his contributions "truly amazing. The guy has a set of ears like you wouldn't believe. He knows how to zero in on a song and bring out the magic. He makes all the time spent getting this stuff recorded really count." Johnson needs little prodding to raise the 'perfectionist' issue, and he does so both directly and indirectly. While he admits that he would like to release records with greater frequency, he's unapologetic for the time he takes in the studio. "You listen to Stevie Wonder singing You And I - are you going to tell me he isn't a perfectionist?" he says. "Now, he might be one of those guys who can just roll out of bed and sing like that all the time, but I'll bet you he sets the bar pretty high. And with my new album, I set the bar pretty high this time." Johnson references Stevie Wonder in a new song called Austin. "It's got that great Stevie kind of groove," he says. "Jonny Lang sings on it, and man, he's so great. Lyrically, the song is about Austin, Texas, which is where I was born and grew up. It addresses what the city used to be and how things have changed so much. "You know, Austin is a big question mark ecologically," he continues. "There used to be so many greenbelts and now things are changing very rapidly because of the city's growth. We've got the Barton Springs watershed here, but there used to be a lot of pristine water hill country that's being compromised. Austin, the song, is my tribute to the city, and musically it's my tip of the hat to Stevie Wonder." Johnson is no stranger to musical tributes. On past albums he's paid homage to jazz pioneer Wes Montgomery (East Wes, from 1990's Ah Via Musicom), blues icon Stevie Ray Vaughan (S.R.V., from 1996's Venus Isle) and country picker Jerry Reed (Tribute To Jerry Reed, from Bloom). In addition to Stevie Wonder, the new album will see Johnson give it up for the band Free with a song called Soul Surprise. "That's a strange one," he says. "It was supposed to be a vocal tune, but I could never get the vocals right, so I made it a slow, slide guitar instrumental song. 'Let's just play this on the backbeat,'" I said, "and we got a really great groove going down. It sounds real nice." George Harrison figures in a song that Johnson wrote when the ex-Beatle died in 2002, but the guitarist doesn't expect it'll make the final cut. "It's a really cool kind of Beatles-y-song, but I don't have a great take of it," he says. "I have to learn not to be so precious about these things, but you know, I just don't feel right letting stuff out unless it's as good as I think it can be." Expanding on his reputation as an eccentric, and intent on setting the record straight, Johnson says, "I'm actually pretty prolific. I have over 100 songs, but I just can't seem to get them recorded. It's almost like taking a water stream that's nice and flowing and productive, but then you try to run it through a ballpoint pen. And the thing is, I care too much to put out songs that I can't feel great about. "Some people have a natural aptitude to play well. Other people have to struggle to play well. I fall somewhere in the middle. It doesn't come real easy for me." "I think there's different levels to people's talent," he continues. "Some people have a natural aptitude to play well - they don't even have to think about it. Other people have to struggle to play well. I fall somewhere in the middle. It doesn't come real easy for me." Even so, the guitarist whose art runs through his blood so deep and results in music as bold as can be imagined reasons that he can, in the future, make things a little easier on himself: "One thing I've noticed is that my records could be a little less polished. I think there's too many fingerprints on some of them; they're a little too manipulated. I've heard a lot of people say stuff like, 'Well, we like him live better than the records,' and I think what they mean is they appreciate the organic spontaneity that isn't so polished. "In the end, though, the finished product is what matters, and I just can't lower my standards. I can't go, 'Oh well, I'm not in tune - whatever.' That isn't what turns me on. What turns me on is hearing a guitar with a great sound and played really, really great. That's what gets me up in the morning."